Coming off a 11-21 season that was the worst in school history, the UNLV Runnin’ Rebels no doubt could use a little confidence boost to start the 2017-18 campaign. The Rattlers, coming off a 7-23 season of their own that saw them ranked No. 349 out of 351 NCAA Division I teams in RPI, as expected put up little resistance in Saturday night’s season opener at the Thomas & Mack Center as the Runnin’ Rebels cruised to a 108-66 victory before an announced crowd of 9,457. Hey, after the Howard football fiasco, UNLV fans know they can’t take anything for granted. Credit Runnin’ Rebels head coach Marvin Menzies for having his team ready to play hard for 40 minutes and taking care of business in dominant fashion. UNLV bolted out to a 28-8 lead in the first 11 minutes, went into halftime with a 56-27 halftime advantage and led by as many as 49 points (103-54) in the second half. The Rebels finished with 27 assists and at times looked like they were taking part in a layup drill, easily carving up the A&M defense. Five Rebels finished in double figures and three – freshman center Brandon McCoy (25 points, 18 rebounds), junior forward Shakur Juiston (19 points, 10 rebounds) and senior point guard Jordan Johnson (10 points, 10 assists) – finished with double-doubles. Senior guard Jovan Mooring had 21 points, including 5-of-8 3-pointers, to go with four assists. Freshman forward Tervell Beck also finished in double figures with 13 points in 12 minutes of action. KEY PLAYER: McCoy, a 7-foot freshman and McDonald’s All-American, missed his first three shots, including a wide open uncontested layup, but was pretty much unstoppable after that, finishing with a game-high 25 points and 18 rebounds, including nine offensive boards. He also added three assists and two blocks in 23 minutes of action. He finished 11-of-19 from the floor. “It definitely was a different feeling in the locker room tonight. 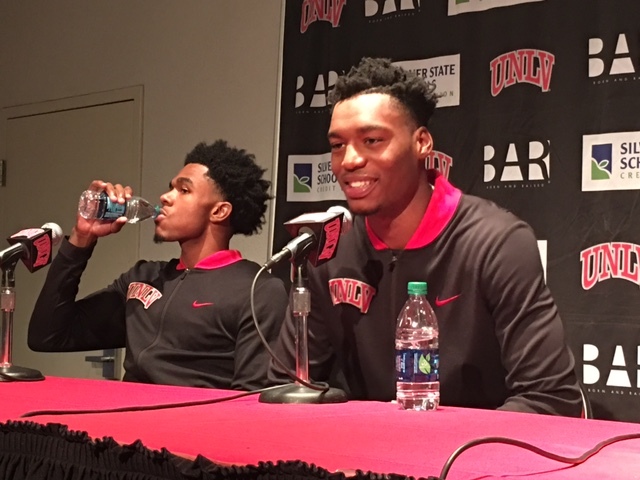 It’s just one of 30.” – UNLV guard Jovan Mooring. “It’s a new season. We need to show our new signature of who this team will be. And I thought we made some nice starts on the initial letters tonight.” – UNLV coach Marvin Menzies. UP NEXT:The Runnin’ Rebels continue their season opening three-game homestand when they host Prairie View A&M on Wednesday night at 7 p.m. at the Thomas & Mack Center. NOTABLE: UNLV finished with a 66-26 edge in points in the paint. … The Rebels held a 12-0 edge in fast break points. … UNLV was in the bonus with 13:04 to go in the first half and Florida A&M was whistled for 10 fouls in the first 9:18. The Rebels finished 19-of-24 at the free throw line (79.2 percent), including 13-of-16 in the first half. … UNLV extended its consecutive games streak with at least one made 3-pointer to 1,007 games. … The Rebels improved to 5-0 all-time against teams from the Mid-Eastern Athletic Conference. … UNLV improved to 48-12 all-time in season openers including 25-2 at the Thomas & Mack Center.